Third year architecture student at the College of architecture, art & design at the American University of Sharjah, UAE. Statement: With the site being in the Sharjah Creek Area, its dense urban fabric has allowed for multiple layers of restraints. This project aimed to reconnect those values and synthesize them in a more contextual and contemporary fashion. The task was to design a pair of art studios/exhibition spaces which will house the creative activities of two different artists, and at the same time host them in conditions provided in their comfort. The project also privileged direct experience such as hot/cold, light/dark, aromatic/sterile and rough/soft. The way in which I approached this project is by separating the public spaces and lifting up the more private spaces where the courtyard space can serve as a communal space and an intermediary that connects both extremes together. 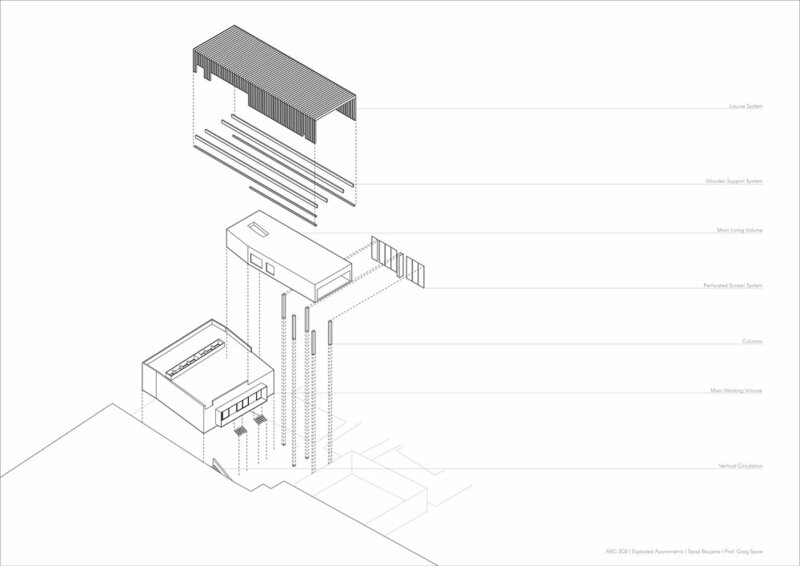 The Entry sequence to the building was as important, this was done by slightly angling the front wall of the public volume as a way to create a hierarchy at the entrance, rather than embedding it in a congested area of the site. 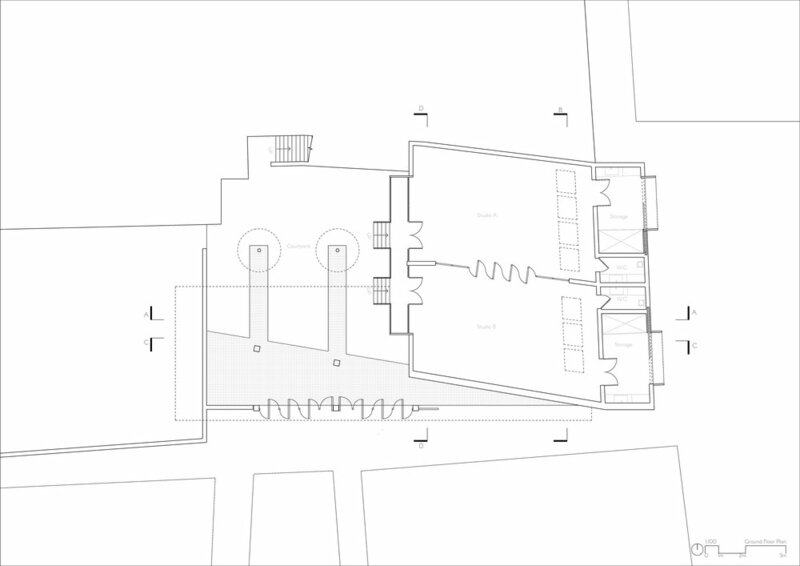 With that, the structural components were laid out across the primary and secondary axes, so that way, the visitors slip in directly from the entry to the courtyard and then into the public volume. 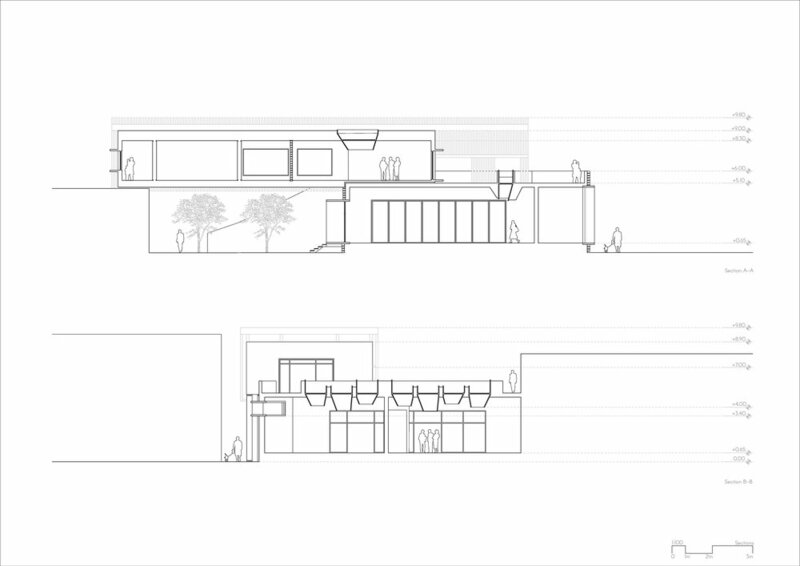 conceptually, the public volume that consists of the studios and the courtyard is considered as a mass, something heavy, that holds and lifts up something that is relatively lighter, which is the private volume. This is physically manifested in terms of materiality, the public volume is cladded with bricks that, at certain points, start pushing and pulling to kind of inform the entry sequence, but also to emphasize on the heaviness of the mass. Whereas, the private volume is enveloped with a wooden system that diffuses light and makes the volume itself much lighter compared to the other mass.